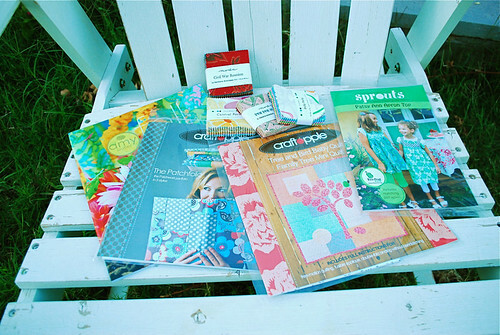 Fall Quilt Market 2010 Re-cap #1 (and massive give-away #1!) - Stop staring and start sewing! 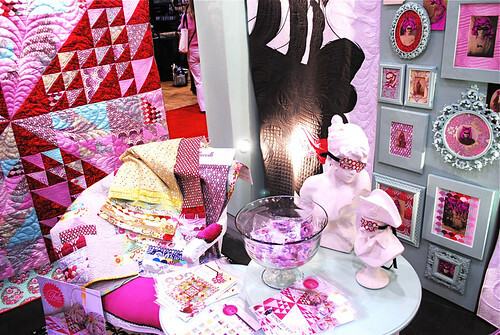 I'm still in recovery mode here but thought I would share some booths from Fall Quilt Market 2010 and start the give-aways. I'll have 5 days of great goodies in a row so don't go to far from your computer! I just have to start out with this booth. I know you can't see much of the booth but honestly, who's looking at the booth? Not me! 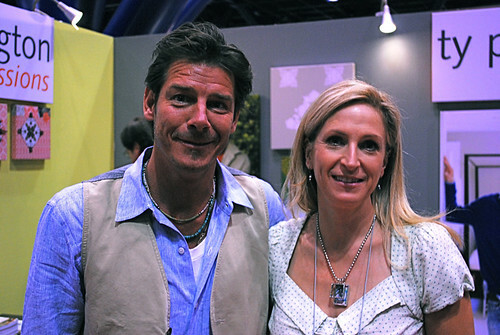 I just happened to show up right when Ty Pennington arrived and before the line formed. My lucky day, right? Okay, now that I got that out of my system....here are some more booths. My sweet friends Val and Anne (Pillow and Maxfield) have a stunning new collection out called Gypsy Bandana with Michael Miller. 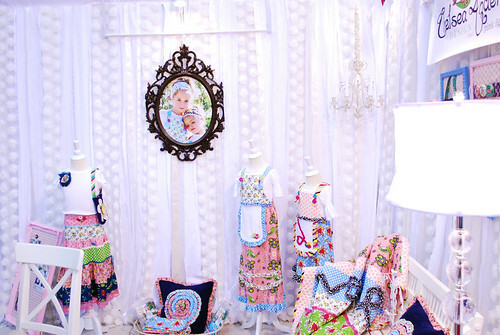 It's rich and colorful and has beautiful border prints and big square bandana panels. I love these gals and their designs just keep getting better and better. Oh, and the booth was a real feast for the eyes too. Patty Young had a beautiful booth (as usual!) and the wallpaper was so much fun. Everyone kept touching it to see if it was real bricks. She has a beautiful new collection called Sanctuary and it includes some soft and silky lawn fabric. Here are Patty and Elinor Peace Bailey. So much color! 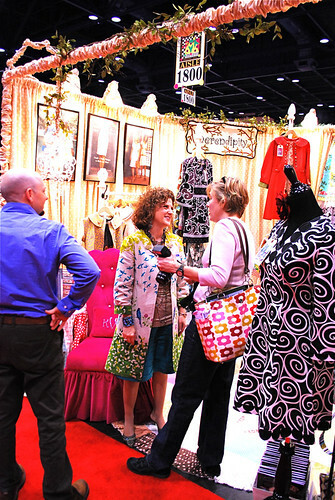 This is Kay Whitt's darling booth and Caroline Devoy of J. Caroline (seen here talking with Kay) covered that stunning pink chair. I will show a better picture later this week when I share all of the Halloween costumes. Kay's costume was the bees knees. 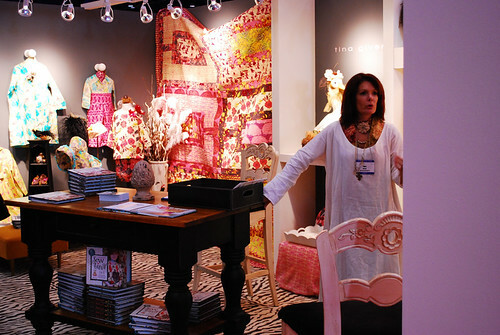 Here is Joanna Figeuroa in her booth over in the Moda compound. 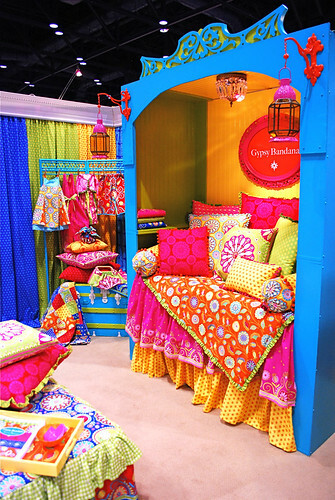 Joanna always has such a pretty booth and her colors somehow manage to be soothing and happy at the same time. Look at the wood floor! I adore Joanna! Here is Chelsea Andersen in her heavenly booth. Chelsea has some new patterns and a new collection of fabric coming out! 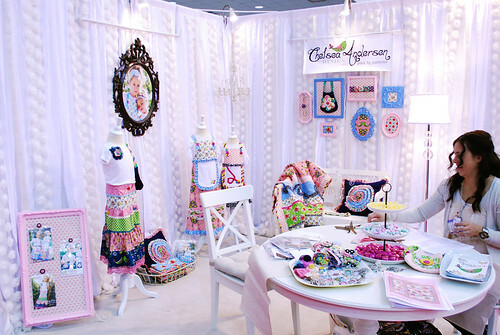 Her booth was so beautiful and a wonderful backdrop for all of her pretty items. Here's the view from another angle. Isn't that pretty? 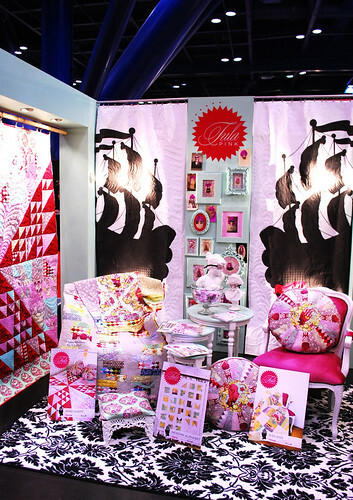 Tula Pink has a collection coming out called Parisville and she is now with Free Spirit so she came out with a bang in this truly remarkable booth. Those ships are part of a black and white quilt and it was a work of art itself. 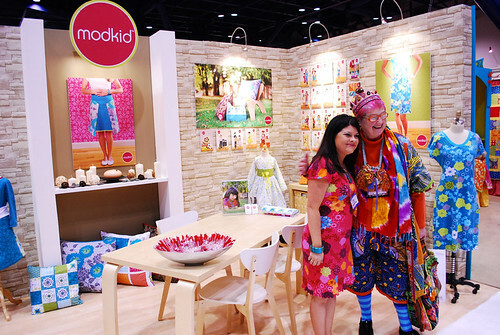 It was a crazy, gorgeous booth with layers and layers of texture and surprises. You could stand there forever just to take it all in. I think I heard more people oohing and aahing at this quilt than any of the others. 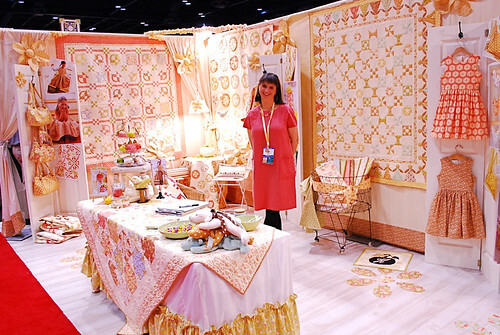 Tina Givens won 2nd prize for a double booth and her booth was really fun and snazzy. She's a very sweet lady and it's always a treat to see her new creations (a book this time!). 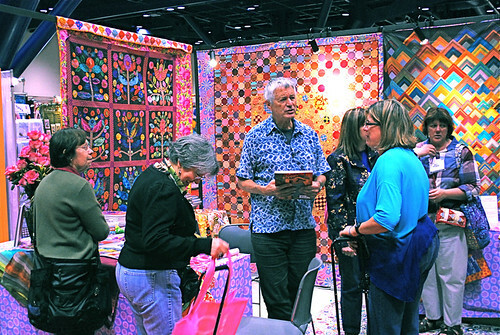 And Kaffe Fassett's booth is unmistakable. He's always there working on his needlework and is very sweet about chatting folks up. Okay, I have a lot more booths to share this week as well as other Quilt Market delights but I want to share some loot with you now. I won a couple of drawings and received some sweet hand outs so I'm passing them on (it really is a treasure trove so don't go to far from your computer this week). Today's catch is a pattern from Trish Preston's Two Peas in a Pod pattern collection (an apron top w/matching doll top pattern), 2 patterns from Craft Apple (a quilt and a "Patchfolio"), 4 packs of 2.5" squares from Moda's newest collections (this is a real treat!) and a beautiful catalog of Amy Butler's latest creations (just for eye candy, but what eye candy it is). Just leave a comment and I'll be back with more tomorrow!